Just a reminder; no Wednesday updates for a while! Oh hey late again WHAT A SHOCK. Felix is a true bro. First up, Argyle drew up this amazing piece after we were talking about Mad Max (one friend said WA was like book of Eli, we disagreed, another said it was like a "cuddly Mad Max"). I'm amazed. It's hilarious and badass at the same time! Oh my god. "Mad Felix...Slightly Miffed road". Hilarious. 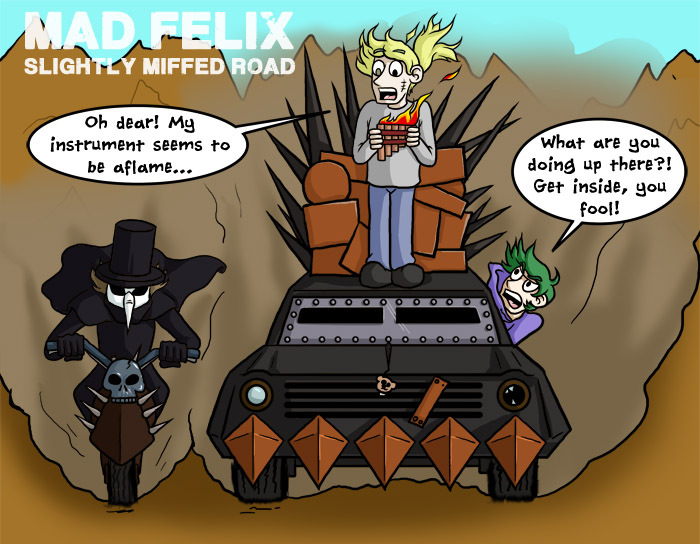 And of course the badass parts- that car, that motorcycle...Felix on the motorcycle! Oh gosh just too damn perfect! ...Drew up this hilarious sequel to this Marcus audition! Oh gosh, yeah, I definitely needed this laugh very much. He told me he'd do a follow up, but I still laughed way too hard. Especially at Jeff. The way he's patting Marcus is too cute. And then the look on his face as he tries to save at least the rest of the chicks...HAH!! EXCELLENT. Mathematical probability of tsundere Benjamin appearing in the relatively near future high. Prepare fangirl armadas for response to the threat. Damn straight! Benny boy has earned some cookies! It really is badass, oh gosh! The Marcus one still makes me laugh! And the ComicFury Best Bro award goes to....! Looks like Benny may get those cookies after all. That Cuddly Mad Max pic is SOOO freakin' amazing. I absolutely love it! 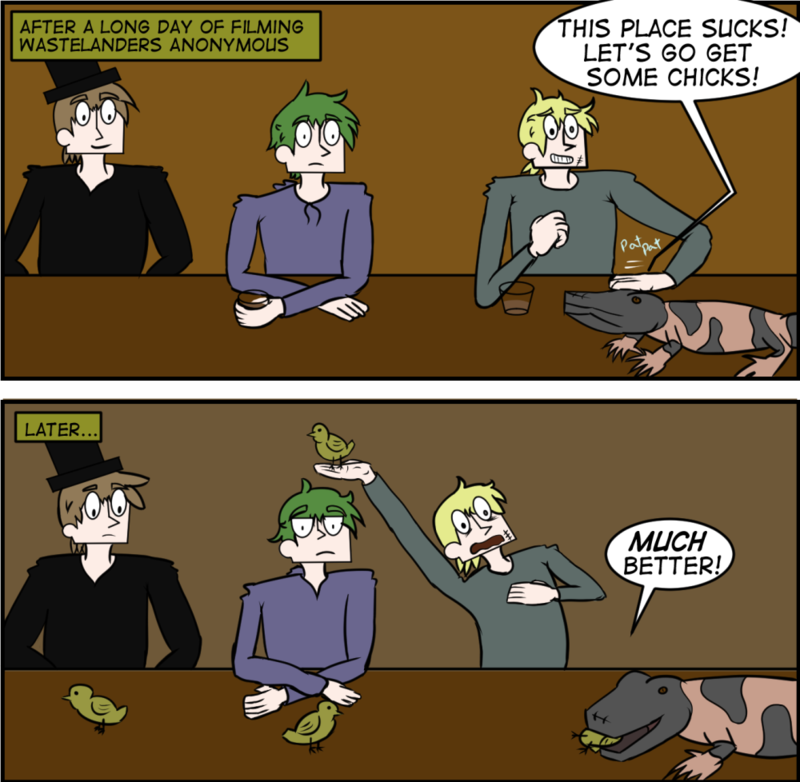 Also Sleepers WA thing with the chicks has me giggling every time I see it. It just captures Jeff so well for me. I needa see this movie even more now! Yes, me too! Oh my god. I mean that's just such a straight up Jeff response. I love that look on his face. The fact he isn't actually saying anything makes it even better, somehow! Heehehe, thanks, glad you think so! Go Felix go! Get Benny some cookies! Felix got yo back, bro. Epic fan-arts! I swear, every week you're back with more! That he does! "A badass and a matchmaker"
*gasps* Would she maybe like Felix, just a little bit? Heheh. A few people seem to want Felix x Anne! Flawless page as usual and lovely fan arts too!! Hahaha! Looks like I created some cravings. Wooooooops!! Ah, thank you very much Skweee! Also that's some amazing fan art! Anne, nobody is fooled by you 'save'. NOBODY. Gosh darn that last panel is just the cutest thing. Felix is so awesome. Neither of them can get anything past Felix, at least! Ah, Anne blushing...she had good intentions making her friend cookies. Heheh, she really did! She's a good girl. Delicious treats for everyone! Nobody wants your after thought food...is what I'd want to say, but when it involves cookies you can just keep sending them down the chain until they get to me. Hahah! Yes, exceptions must be made for desserts! Haha! Slightly Miffed Road! And, I love how Jeff is trying to save that chick! Hahahah, right? That title really cracked me up...And then the chicks...! "Heh, these two are so ridiculous." Does it look like I'm lying?